The New York Law Institute partnered with EOS International and Debevoise & Plimpton, LLP to develop a Seamless Catalog Module which enables NYLI member libraries that use EOS.Web® to directly integrate NYLI’s entire collection, seamlessly within their own catalog. The NYLI Seamless Catalog Module adds functionality that in essence transforms a members’ OPAC into a one-way union catalog in which a library can view all of NYLI’s holdings while keeping their own holdings private. This module is available for free to NYLI members. We thought this would be an innovative way of offering “just in time” library services integrating the use of existing technologies to fulfill the information needs of attorneys and other legal professionals. We have seen that many firm libraries are moving from an ownership to an access model due to space and cost considerations, and have been steadily downsizing their print collections in favor of only purchasing and housing essential materials. The goal of our Seamless Catalog Module initiative is that member libraries will be able to eliminate marginally used print volumes such as treatises and other serials while still offering their attorneys seamless access to what they need. With the Seamless Catalog Module, our members have access to a robust collection of holdings -including our 160,000+ eBooks, enabling them to make collection development decisions based on what NYLI offers. Our new eBook initiative has changed the dimensions of this project and enhanced the Seamless Catalog’s value while changing the focus from strictly an ILL delivery component to desktop access to a robust eBook collection. Aside from benefiting our members, we hope that this project will encourage others in the field to develop similar functionality for other ILS programs, and eventually offer platform-independent functionality. This could be the first step to a new generation of collaborative efforts to share holdings while respecting the level of privacy of participants. 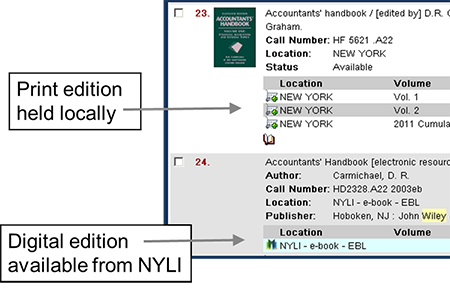 The NYLI Seamless Catalog Module can work independently for browsing print materials and accessing eBooks or with EOS Web ILL module to order and track loans. Once a member library has installed this free module, their attorneys and library staff can search their catalog and return a real time availability stream for all item records in both their and NYLI’s catalogs. NYLI appears as a branch location within their system. Duplication of bibliographic records is avoided by suppressing NYLI’s records when the member library has a record. 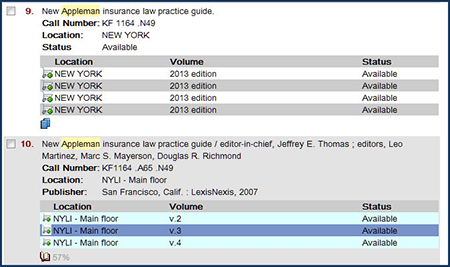 Attorneys and library staff can search their catalog and select any of NYLI’s holdings instantly. Upon selection of an item, an automated (ILL) request is immediately submitted to NYLI. The request includes all the standard bibliographic data as well as patron name, client matter charge, requested timeframe, and notes for special requests or information. If an ILL request is generated, rather than simply accessing NYLI’s holdings, the member library also receives a notification for that request for tracking purposes. The ILL request is processed by NYLI and the material(s) are delivered the same day (usually within hours) to the member library. Member libraries can also run reports and view items borrowed from NYLI via this process within the EOS ILL interface. If you’d like to integrate our collection into your OPAC through the NYLI Seamless Catalog, the first step would be to contact Jackie Prentice at EOSWeb. The Seamless Catalog module and corresponding ILL module are both available free to NYLI members and they can help you get these installed. You will also want to be sure to have upgraded to the Discovery OPAC which is the latest version of the online catalog. And finally, we have created a Welcome packet for new users with technical documentation for how to set up the Seamless Catalog Shopping Cart and how to add a media type for eBooks so that your users can restrict their searches to just eBooks. These documents can be downloaded below. Welcome to the NYLI Seamless Catalog!